A baby tooth gets knocked out– Please call the office to schedule an emergency visit. A permanent tooth gets knocked out- If your child loses a permanent tooth, please call the office immediately. It is crucial to replace the tooth as quickly as possible. Handling the tooth by the crown, gently rinse the tooth, but try to avoid touching the root. If you can place the tooth back in it’s socket, have your child bite down on gauze to keep it in place until you get to the office. 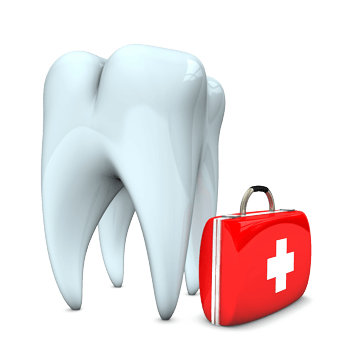 If you can not place the tooth, put the tooth in a small container of milk or saliva until we can try to re-attach the tooth. A tooth gets chipped or broken- Gently rinse the area with lukewarm water, and have your child place a cold compress on their face to reduce swelling. If you can locate the piece of broken tooth, place the piece in milk, and bring it with you to the office. If more than half of the tooth is broken off, please call us immediately. A tooth is displaced- A displaced tooth has not been knocked out, but has been pulled out to appear elongated or pushed in and appears shorter. It may also be pushed forward, backward, or sideways. If your child experiences tooth displacement, call to schedule an emergency visit. The sooner we can put the tooth back in place, the better. During office hours, immediate attention will be given to your child’s situation, and will be seen as soon as possible. After office hours, please give the office call and follow the instructions provided. Your call will be returned as soon as possible. If your child is experiencing a serious or life threatening emergency, please call 911 or Hatzolah at 718-871-6644. If needed, please proceed to the emergency room. Ask the pediatric dental resident on call to page Dr. Wagshall.